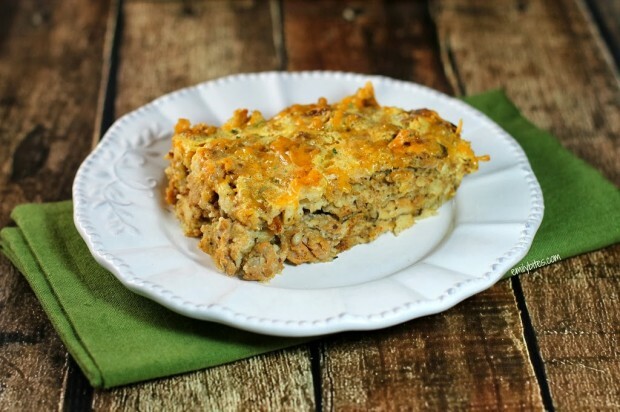 I’ve been meaning to make a breakfast casserole recently, so I pinned a few on Pinterest for inspiration and a fabulous reader named Lisa linked me to the original recipe for Cooking Light’s version of this Sausage and Stuffing Brunch Bake – thanks, Lisa! 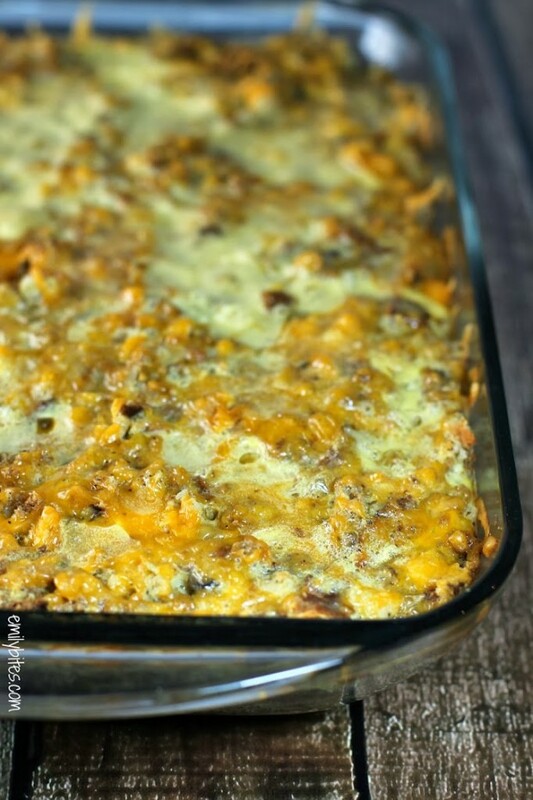 I was immediately sold after reading through the ingredients list; Italian sausage (love), sharp cheddar (my favorite), STUFFING (OMG, yes please). The egg substitute pulls it all together and makes it breakfast worthy and the hearty hot sausage and herb seasoned stuffing give it tons of flavor and bring it into brunch territory (or lunch or dinner or any time you like). I used a little less stuffing and cheese than the original recipe (don’t worry, there’s still plenty) and added in onions, garlic and mushrooms for additional volume and flavor. You can definitely customize it to your preferences; my fiancé hates mushrooms so he said he’d add bell pepper instead – feel free to get creative! The portion size for this is very large and filling and it makes great leftovers. Cook it on the weekend and save it for breakfasts or lunches all week long! Pre-heat the oven to 325 degrees. Lightly mist a 9×13 baking dish with cooking spray and set aside. Bring a large saute pan or skillet over medium-high heat and add the sausage. Cook for a couple minutes, breaking it up with a spoon or spatula for about 2 minutes, until it begins to start browning. Add the onion, mushrooms and garlic and continue to cook for another 4-5 minutes until the meat is cooked through and broken up and the vegetables are softened. Transfer the cooked sausage mixture to a large mixing bowl and add the stuffing mix (unprepared). Stir to combine. Transfer the stuffing and sausage mixture to the prepared baking dish. Drizzle with the chicken broth and melted butter. Sprinkle the cheese evenly over the top. Combine the milk, egg substitute and pepper in a bowl and whisk together until combined. Pour over the top of the stuffing casserole. Bake for about 40 minutes or until set and cooked through. Let casserole cool for 5 minutes and cut into 9 pieces. I knew you’d like it – it’s one of my most requested dishes. This looks great! Can you use breakfast sausage rather than Italian sausage? Would it change the points? Sure! The points would of course depend on the breakfast sausage you use, but I’m sure it would still taste delicious! can you use stove top stuffing? I haven’t made it that way but I don’t see why not as long as you use the same amount. How long would this last in the fridge? Could you freeze it? I’m guessing about a week in the fridge. I haven’t frozen it but if you try it then let me know! You had m at stuffing, yum! Had this last night and everyone including kids loved. I’m just trying to figure out the portion size. Is there any more guidance than nine? Due to the shape of the pan I have no trouble with eight or ten as that’s just doing a grid, but nine makes it harder to figure out. Any cup serving size possibly? I definitely want to try this one! Thanks for such a great site! Hi Beth, nine servings is also an easy grid! You just cut twice each direction to make 3 sections each way. That’s what I do! What could I use instead of egg substitute? How many real eggs, or would just egg whites in a carton do? You could definitely do a carton of egg whites as long as it was the same size. I believe 1 carton substitute = 8 eggs if you’re substituting. I made this for dinner at my husband’s request. It was delicious!!!! we just had this for dinner the other night and now i’m going to be making it for my MOPS group. it was so good. i could have eaten the whole thing myself. i am wondering, for future reference, if you think you could prepare this at night, refrigerate and then bake in the morning? I made this for my Mom, sister, niece and friend and it was a HUGE hit! My sister, who hates lowfat ANYTHING, told me I can make this anytime. Another delicious recipe! I used two boxes of the whole wheat stove top and it was AWESOME. Love your recipes, Emily! How do you think this one would do subbing quinoa for stuffing mix? Whoo hoo, perfect for the brunch I’m going to next weekend! Thanks (other) Emily! 🙂 Hope you love them! I am making this for Easter brunch. I’m wondering if I could make it the night before? Could I use almond milk instead of skim? I love it when the “best of” list comes out! I always find something I’ve missed during the year. Made this today, and OMG. YES. This really hits the spot. I used mild Italian Sausage because that’s what they had when I made a quick trip to the store, and it was just fine. Thanks! Thanks Khrys! I’m so thrilled you found this one and love it :). Thanks for letting me know! OH MY GOODNESS, this is so good! I just made it for breakfast next week. I wasn’t really sure what to expect, but this is amazing! Made this for the first time today! I subbed bell peppers for the mushrooms and left out the cheese because I didn’t have any on hand. Still turned out great! Can’t wait to eat it all week for breakfast! Mmmm… I’m going to have to have a group over for brunch just so I have an excuse to make this! Thanks for sharing. I made this today in 1/3 the normal size since it’s just me and my husband. It was really good. The only thing that bothered me was that the cheese rose to the top and was kind of a weird texture, like rubbery and chewy instead of cheese like. I used the Cabot 50% light sharp cheddar. Maybe I’ll try melting it in to the meat mixture next time instead? For the most part though I loved it and I made a whole bunch of extra pre-cooked chicken sausage and froze it, so now I can make it again anytime quickly. Thanks for the great recipe! That’s weird about the cheese but I’m glad you enjoyed it! Hi Emily – Your recipe calls for “light butter” – what is that? Can you suggest a brand? I’ve honestly never seen light butter in the stores I go to. Do you mean margarine? Thank you! 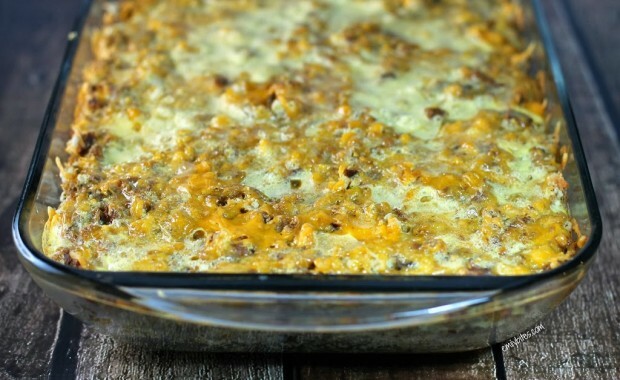 I’m looking for a make ahead breakfast casserole for Thanksgiving morning; can this recipe work if made the night before? Every recipe of your’s that I’ve made has been very good; thank you for all the work you put into these delicious discoveries. How many whole eggs would you suggest in place of the egg substitute?